And... she was unable to find out the solution for such a stupid equation. So, she has asked me about the person who wrote that equation, and that too on the board. When I pointed towards my programming teacher, she started questioning how it is possible to have j = j + 1. She started writing down a few steps on the board to prove that our computer science teacher was wrong. I'm sorry if you have expected some kind of action episode in this page. But, that was all. So... what I'm trying to say here is few of us(or at least - myself) should un-learn (is there such a word?) some things (especially in mathematics) while learning programing. 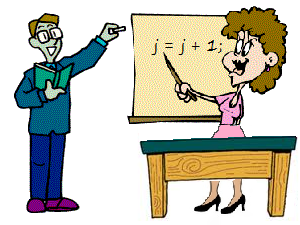 are explained to the students (A) even before they learn about number representation in computers and (B) after they deal with Mathematical notations. The worst thing is, when a student is confused between Maths and computers, there is a high probablity of getting discouraged - especially when he is not fortunate enough to have good teachers. It takes time for those confused students to understand/adjust. I always wanted to have some kind of quick reference for Differences between Mathematics and Computer Science. Creation of such quick reference is on of the main reasons to create this blog. 1. Yes, there are some really smart people out there who were able to understand why 2/3*3 != 2 at the very first time they had a look at it. This blog is much below their standards. 2. And I also agree that there are some easy to learn languages for the beginners, which won't require the learner to worry about types and precision. But how many institutes have such languages in thier syllabus? 3. And finally.... to be honset, I don't have much useful information in this site as of now. This is just a site under development.